You could try doing it now, but if you wait until the proper moon phase you will get an extra power boost from the moon. Unless it is urgent or an emergency I would suggest waiting to work on the right moon phase. The folks at LM put a lot of energy into the items they make and so I think it is gracious to do the spells as they instruct. Thanks for the reply. I forgot to ask about the mojo bag that comes with it. The instructions don't say much about the bag @ all. Is the mojo bag ready to be worn or do I have to fix it? If I do have to fix it, how am I suppose to do it? I've never worn a mojo bag before so I have no idea how to fix one up. Put a personal concern in the bag, such as hair or fingernail clippings. Tie the bag and dress it with Crown of Success oil. You can also add a petition paper to the bag if you wish. ...exactly, unless it is needed now! Ive decided to wait. I want to do it correct. Its not an emergency so it can wait. Thank you ladies! I bought a CoS oil a few months ago and have been wearing to work to help overcome some problems (gossiping, back stabbing, lies) & I can't begin to explain how things have turned around for me... !!!!! I dont think it is a coincidence when the manager that used to hate me and make my life miserable is more approachable and even recognizes my hard work. I love the smell and have my little bottle with me at all times. There is no doubt LM goods are the real deal. So today was my final exam in statistics which i was taking as a pre-req to applying for a graduate program. Let me back track and categorically emphasize how much i abhor statistics...needless to say my prep was ok but this was an extended response type exam ...so you had to show every step of every formula and its derivation and then find the appropriate research method and prove blah blah blah...the only saving grace was that it was open note, ie one could bring in one's notes to refer to. The rationale is that in the short time frame allotted, you cannot really cheat unless you know what to look for in your notes, unless well you know your stuff pretty well already. so what i had done was printed out whatever i had studied, including the sample test papers they had sent us, which I had worked out correctly, spending hours over it... i rubbed CoS on my hands before starting the exam, and opened my paper, and i could not believe my eyes: my exam was word for word the same as the sample that had been sent out: not just the type of question BUT THE EXACT SAME THING, numbers and all....wont relate the obvious but i also fixed the edges of the exam paper with CoS oil ...over kill perhaps but hey ! What a wonderful testimony, thank you for sharing. I also bring out the Crown of Success to ensure great results on my exams. In addition to hard work off course! I just received my COS spellkit and I just have a few questions. 1.How can I know when the moon is new and the waxing is strength? I should start exactly at night on the first day? or right before dawn? 2.It says start well before sunrise to finish by dawn.So I should keep working the spell til dawn? So I should begin while the moon is waxing and then wait till maybe an hour before sunrise to finish the ritual or? You do not need to start the moment the moon changes. You certainly do not eed to start it TWICE> Start the spell before sunrise after the change of the moon. I recently used crown of success with steady work products to help with work. My company was taken over by a new management company and we all had to reinterview for our jobs. I dressed all my documents with steady work powder, I lit candles dressed with crown of success oil and dusted with steady work powder for a week before my interview, I put crown of success in my hair the day of my interview ( hence crown of success) and a dab in my right hand right before I went into the interview so when I shook hands it would be on them. I also prayed to my saints st jude anthony and joseph and prayed a lot to God. I was one of 6 employees they rehired out of 60. great product! thought id share for those who may end up in similar situations. Thanks alot.Today I overslept and didn't do the ritual before dawn.Does it really matter as long as I do the ritual everyday? Yes, timing is a very important factor in conjurework. You are linking your work to various tides of natural energy - and sunrise is an extremely powerful time when you are trying to grow and draw things to you (in this case success). Of course, as it's been said before, we're not the Hoodoo Police, so you're free to do whatever you wish. However, the kits outline a very traditional and time-honored method of working, and if you choose to not the follow the directions that's your business, but understand that you're stepping outside the guidelines for this work. Your results may reflect that in the end. Well I'll make it more of a point to perform the ritual before dawn,but it's hard getting up so early in the morning..
Well, you can do whatever you want, and it may work to some degree. But again the waking up before done has been successful for years of tradition. Im sorry it just sounds like you are being a tad bit lazy. Just set your alarm, or go to be early, and then you get the success you deserve...if not..then well, I guess you will remain in the same state you are in. starsinthesky7 wrote: Well, you can do whatever you want, and it may work to some degree. But again the waking up before done has been successful for years of tradition. First of all the only reason why it was a problem to get up early in the first place because I don't get to bed until 3:00am most nights.Every other day I've gotten up before dawn and performed the ritual.It's not a big deal,but I was simply wondering how critical that aspect of the ritual is.So I'm sorry,but you are out of place.Thanks for the replies though. I purchased the Crown Of Success spellkit and I'm on my LAST day.The only problem is,I was supposed to get up way for b4 dawn to get to the crossroads in time.After all that work,do I have to start the ritual all over? I figure i'll just wait until tomorrow morning to finish it properly or should I just do it today? Help me please.I'm scared that it might not work now. Re: Crown of success kit. Do not doubt your work, and be scared that it may not work. Yes you should still take it to the crossroads today, and continue with the work as completed. The fact that you did not go to the crossroads could be due to your lack of concentration and focus. But it is not that the work will not be successful, but it may not be as effective. But this is only the bath part of the work...and things still may be successful for you. Make sure you take the remains and dispose of them as directed. Now you can do several things to back up your work. 1. Get a crown of success vigil light. This will help back up and further aid in the work you just did. 2. If you have any remaining bath crystals, I would bathe in them for at least 3 days or another week. And dispose before Dawn. 3. I would wait at least 2 weeks to get a check up reading to see how the work went. Thanks alot for your reply.I'll do finish the ritual today as planned.This may sound like a stupid question (that I may already know the answer to) but can I use the crossroad near my house that has a railroad and street (the street goes over the railroad tracks)? Yes you could. They are two roads that cross, but you may opt for the more traditional roads such as an intersection of two roads crossing. starsinthesky7 wrote: Yes you could. They are two roads that cross, but you may opt for the more traditional roads such as an intersection of two roads crossing. I did it but the sun went down before I could get out there(as I type this the sun came back up).I have just been such a mess mentally speaking,so it was difficult to complete the ritual,but I did to the best of my ability.The only thing I have left is the incense powder.I know it says to get rid of the remains,but I couldn't just possibly keep it to burn every day?I wanted to dress a white candle with the little bit of crown of success oil I have,burn the incense down and say a prayer. When it says get rid of the remains, it means the remains of the candle wax, petition paper. NOT the left over supplies. You can save those for another time. Like I said, you were probably not focused. You need to probably repeat the spell or let a rootworker do the work for you if you were not able to fully put your all into the work. Hello All. 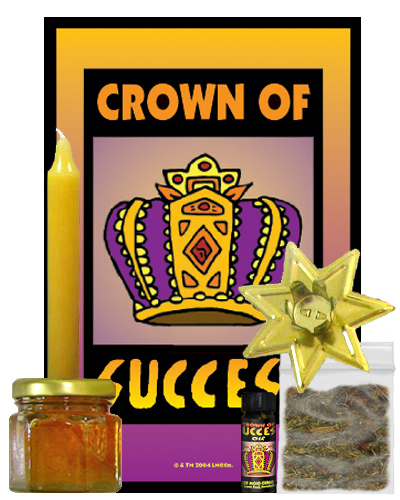 I received my order a few days ago for a Crown of Success Honey Jar Spell Kiy and 12 altar purple candles. I am still not too familiar with Lucky Mojo's Products. But I am planning to use the honey jar for my school application (Masters degree). So in my case, how do I use the honey jar spell kit? What steps should I take? And how long does a honey jar spell kit last? You want to 'sweeten' the admissions committee to you. You will use personal concerns of the committee, like business cards, signatures, etc...with similar concerns of yours... Not to second guess you but I would have started with the Crown of Success Spellkit for success in all that you...than when you get the committee information go from there....just a thought. Thanks jwmcclin! But now I think, if I don't know the names of the admissions committee, how do I 'sweeten' them? Plus, is the honey jar only for 1 person? Let's say there are a few admission committee members, how do I make this work? If you cannot get the names of the members you can write all the members of the admission committee of ________. This will not be as strong a link as having their names, their signatures or other concerns. The honey jar is not limited to one person. Hello Miss Ida Lundin, thanks for your help! I was wondering if I know the admission committee must be some professors (but don't know exactly who), and I can actually find the names of all professors. Can I write the names of all profs? Sure you can! There is no harm of all the professors being sweetened to you. Thanks again! You have helped me a lot. I just have 1 more question. If I put all the names, how should I write all the names of the sheet of paper? The instruction indicates that I need to write a person's name 3 times, then turn 90 degree, and then write my name across for 3 times. If I target to sweeten more than 1 person, how should I do this? Thanks again! Really appreciate your help! I would write all of there names once, underneath one another. Turn the paper and write your own name over all of their names. I would write my name once for every person on that list. Hello all. I am planning to use my crown of success kit soon. I am reading the instructions and I know that for the first day dawn, I will need to use the bath crystal. For the 9th day I need to use the 9-herb bath. However, I am not too sure about the 2nd - 8th day. Can anyone tell me if I need to do the bath rituals during 2nd - 8th day? What do the directions say? I would use the bath crystals for the first 9 days, and on the 9th day you would use the 9-herb bath. They are two separate products. Working Crown of Success for someone else? I just ordered the spell kit for my husband, along other things....first, I have to say how pleased I was today when I opened my mail box and it was there!!! After only few working days....everything is amazing! The spell that came with the kit calls for the petitioner to take a bath at dawn. I was wondering if that can be me or it has to be my husband. He works the weirdest shift and would never in millions years wake up and do this with me. The crossroad ( I read what was written about crossroads on the page) - can it be one at my subdivision or a main street? Can I drive there? Re: Working Crown of Success for someone else? 1. If your doing the work, then follow the directions, perform the work at Dawn as it states. If it's for your husband, just petition the work for him instead, you can still do it. 2. I have no clue what a subdivison is, but rootwork has no shortcuts, and I'd follow the directions accurately. Make sure you wakeup fairly early at dawn, do the bath ritual, and then grab a cup or a basin of the water, and dispose of it at a 4-way crossroads, where 2 streets criss-cross. No main street. Sure--you can drive there too, just find the closest one to go to that has less traffic conditions...and do the ritual--once your done, drive [or walk] home, and DO NOT look back. So, when I pour the water over my head, instead of saying "I", I can say his name instead - right? Sorry for bugging, I just want to get it correct. You can't really bathe on his behalf, it doesn't work that way. But if he is completely unwilling to take the bath, then I would suggest you make a wax dolly of him and bathe the doll in proxy. Can I buy a wax figure from Lucky Mojo or do I have to make one on my own? It's not uncommon for folks who grew up with conjure to drop bathwater at the crossroads -- any four-way intersection -- on the way to work, just by pouring a cup out the car window. It's a fairly inconspicuous way to do it. Looks like you're just pouring out melted ice-water, but you know better. A wax figure is easy to make with modeling beeswax or that honeycomb-y sheet beeswax that comes in colors. You could also buy a figural candle from Lucky Mojo to use as a waterproof dollbaby to stand in for him. Other people will buy a male doll or action figure from the toy store or thrift store. That is correct, you most definately can prepare a customary dolly, or order one from the Luckymojo Shop, makedonce78. LOL, I like the action figure or doll baby MissMichaele commented, that sounds great. Thanks to you too, Devi for clarifying my comment earlier. Thank you thank you all soooo much!!!!! One last question and I wont bug anymore on this issue - do I bury the doll with the remains of the spell or do I keep it? Since it's for a good and friendly purpose, keep it -- although you could bury it in your yard or under your house, if you don't expect to move anytime soon. Thank you soooo much! I know I said it millions of times, but I really appreciate everything and everyone giving me points in this thread. Much love. I just checked the calendar and although I wanted to start asap I want to get the most out of my work so I'm waiting to the next new moon. I have a few questions about the Crown of Success Spell Kit. 1. Do I have to bathe in COS Bath Crystals and throw out the water at a crossroads for ALL 9 days? Or ONLY on the First and 9th day? 2. For the 9Herbs Spiritual Bath, the instructions says to boil it in spring water or rain water, but wouldn't tap water suffice? If not, can I use Poland Spring Bottled water? 3.Can I wear the COS Mojo bag on me before the 9th day? Or must I wait until the spell is complete? 4. The Instructions says to pour the water over your head 9 times; however, I am African American, and my hair will be a hot mess if I let it air dry. Can I just pour it over my face and skip the hair? 5. Instead of using a basin to throw out the water, can I use a a plastic cup? I live in the city where people are always walking around outside, and it will seem a little strange if I was walking around with that. 1. If I recall correctly, the directions on that kit for COS say to use half the bath crystals on the first day, bathe in them and throw the water at a crossroads, and repeat this ritual with the second half of the bath crystals on the 9th day. Think of it as "bookends" to your spell: you're beginning your 9 days of spell work with a Success bath, and you're ending it with a bath. You don't have to do the ritual bath for 9 days. 2. It is traditional to use spring or rain water for spiritual baths; this is water that has been "untouched" by human intervention, like pipes or plumbing, and it is an important part of historical Hoodoo tradition, when people used river water or rain water to bathe in. If you had absolutely nothing else, tap water is OK, but try the bottled spring water; you will notice a difference in the quality of the bath, spiritually. 3. Wait until the spell is complete before you wear the mojo bag. The candles are "feeding" the mojo bag with their light and heat; just follow the written directions on the kit and the bag will be ready to wear on the 9th day. 4. Excellent question! If you don't want to mess your hair, you can bathe from the neck down. Just pour the bath water over your body from the neck down and wipe your face with it, avoiding your hair. Thinking about buying this one. I have another question. I live in an apartment and do not have a yard to bury the remains in after the spell is finished. How should I properly dispose of everything? I have a question for the Crown of Success Spell Kit also. The next new moon will be Christmas Eve, would it be appropiate for me to do this then? Also I will not be at my own home but would be traveling, Can I take it with me to begin and then move it to my own home? I'm on Day 2 of the Crown of Success kit and my success candle burned with a large flame making it melt really quick. I even tried putting it out and couldn't snuff it out right away. I still have 7 days with a little piece of candle. I was thinking of using it until it was finished and replace with a sabbath candle that I blessed and rubbed with the oil. The purple candle burned just the same. Any ideas?